We often have problems with the toilet flush. Therefore, choosing the best toilet flush valve for the job becomes essential. From minimal noise, economical water use, to an efficient flush system, the potential benefits are quite numerous. Let’s face it, the flush valve takes a lot of stress, and it’s often the first component to go. That gives more reason to look for top quality; one that can withstand the daily attrition. But it’s much easier said than done. So why not save you the time and effort? This article helps you find out the best-rated toilet flush valve options. Plus, we have a buying guide to help you narrow down your choices. We’re going to share a comprehensive review of 10 flush valves, which can optimize toilet performance. Remember, our selection relies on research and personal experience. Minor upgrade, but with significant impact is what Kohler brings to your bathroom. Kohler GP1138930 is one of its flagship creations, a universal valve adaptable to all types of toilets. It’s a genuine innovation, both in design and performance. Be it durability or effectiveness, this flush valve ticks all the boxes. Put simply; it’s a robust piece you can trust. Fluid flow is adjustable, which makes an efficient water-saving mechanism. 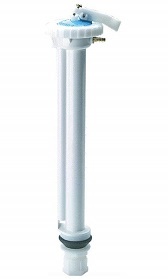 The length is expandable to almost 14 inches to accommodate standard cleaning requirements. Adjustable shutoff height and easy installation are the other added benefits of the expandable length. You only need common tools for installation. It fills a lot quicker than other valves in its class, which significantly reduces waiting time. In most instances, a full refill of the tank takes less than 40 seconds. It’s incredibly silent compared to older versions. Instructions are a bit lacking. So, it may be confusing to the average DIYer. However, you need just a couple of minutes to figure everything out. Kohler GP1138930 is a reliable, durable valve with an overall impressive performance. If affordable quality is what you need, then nothing compares to Kohler in that regard. Unparalleled quality assurance is something you can’t miss in Fluidmaster fill valves. Pair that with a solid frame flapper, and you have a perfect repair kit for a running toilet. 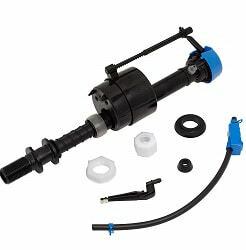 Fluidmaster 400CRP14 is a standard repair kit. 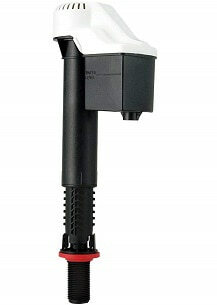 It includes the iconic 400A anti-siphon fill valve and the rugged 2-inch 501 flapper. 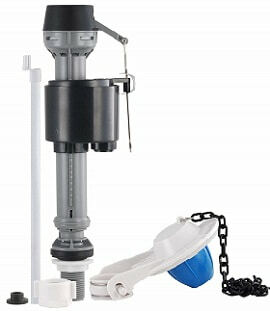 The kit is suitable for systems with a flushing capacity of 3.5 to 7 gallons. It has a universal design to fit any toilet model you have. For instance, you can adjust the height of the valve shank from 9 to 14 inches to match the specific model you’re using. The valve refills quickly, up to two times faster to save both time and money. Want an adjustable water volume and a noise-free operation? The 400A valve nails them both. With the anti-siphon design, there’s no risk for freshwater contamination. The solid frame is a significant improvement over the conventional flexible structure. It doesn’t twist, so you get the best seal every time. Apart from the solid construction, that flapper has anti-microbial protection. It combats bacteria and prevents the flapper from breaking down. The kit is resistant to chlorine, hard water, and corrosion. Fluidmaster 400CRP14 offers top-notch design and extreme effectiveness. It hails from a reputable manufacturer, which makes it one of the best of its kind. Remember, the kit doesn’t fit side entry valves and flapper-less toilet models. Some might call it a “selfish” design, but the great performance of this fill valve is all too clear. But why selfish? The valve is specifically for TOTO TSU99A.X flush tank in mind, so it’s not a proper repair and maintenance part for other brands. EcoPower and Hydrotect features make TOTO an Eco-friendly option. The self-cleaning Hydrotect provides good anti-microbial protection. EcoPower offers a hands-free experience and superior hygiene. It generates power from moving water, which saves electricity. The valve aerates the flow for efficient use of water. A built-in sensor keeps the tap from running when the tank is full. The height is adjustable to match your specific flush tank. For a two-piece toilet, you can adjust the flow rate as per your needs. A complete instruction manual makes installation pretty easy. The valve is available in three different styles: traditional, transitional, and contemporary. So there’s always a unit that will match the style of your toilet. TOTO isn’t your best all-around fill valve. But one thing is clear; you’ll never go wrong when you pair with a TOTO toilet system. Remember, fit in other toilet systems only when you’re sure it will work. Corrosion and deposits on flush valve seats can result into costly water waste. Korky 2003BP provides a quick and easy fix. Best thing, you don’t have to remove the toilet tank to make it happen. The kit includes a rubber flapper, the toilet valve seat (plastic), and silicone sealant. A red rubber material provides long-lasting resistance to chlorine, bacteria, and hard water deposits. The rubber is flexible to provide a tight seal. It’s pretty versatile to eliminate the need for mounting ears. 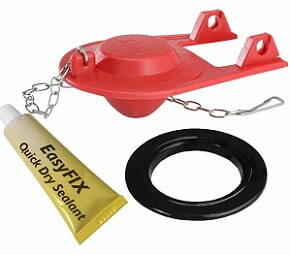 A stainless steel chain resistant to rust and corrosion attaches to the flapper, so no need to make a separate purchase. A quick-dry silicone offers a fast seal in less than 15 minutes. For the best result, ensure to use the flapper on plastic or brass flush valve seats. Korky 2003BP repair kit works pretty fast. The quality is impressive, and durability is at its best. It’s definitely worth your consideration. Compare 400AH fill valve to the classic Fluidmaster design, and you’ll notice a significant improvement. It ranks among the most effective fill valves on the market. It utilizes PerforMAX technology to provide two times the refill rate. In doing so, it keeps the water level in check. For instance, it prevents inadequate or excessive bowl fill level. The valve provides a powerful performance without a noise penalty. You get an ultra-quiet fill that’s far superior to standard valves. An adjustable roller-clamp controls the water volume to deliver the amount you need. The height is adjustable from 10 to 15 inches. 400AH valve works best with 502 flappers. It fits both old and new 2-inch flush valve toilets. To some, it works just as well as the 400A model. The instructions are far more comprehensive. For instance, it details how to use with dual flush valves, 3-inch valves, and the standard 2-inch valves. Fluidmaster 400AH is among the most outstanding options for high-pressure flushing. It’s a solid replacement for standard valves and compatible with most big toilet brands. The design is flawless, and the installation is a breeze. Forget the old Power Gravity Toilets and G-Max technology. Korky 528T provides a newer, more efficient replacement. Best thing; this latest replacement is as affordable as they come. The valve fixes three common issues, which include noise, slow or no refill, and running toilet. It’s incredibly silent, a feature that represents one of its most significant assets. It has undergone a lab test to make sure of that. A twist-lock mechanism makes installation pretty straightforward. It requires no tools and is extremely user-friendly. The package comes with all the necessary parts. Korky 528T has a universal design that provides a wide range of adjustability. It fits most toilet brands, both 1-piece, and 2-piece. Apart from being silent, it delivers a high volume of water. You can replace it with the tank intact. A strainer traps sediments and makes the valve serviceable for longer life. Korky 528T is a remarkable improvement over the old technologies. It’s reliable, silent, and offers a simple, elegant design. The general impression is excellent, and so is the performance. HC660 HydroClean offers a practical, affordable solution. It’s a smart innovation that tackles two significant issues: leaks and miscalibrations. 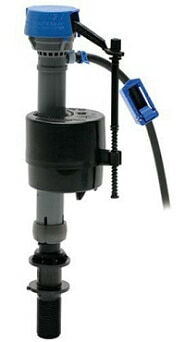 A built-in mini valve ensures proper calibration. It does so by adjusting the water refill level in the tank. The refill is fast, so you don’t have to wait for long. One major selling point of HC660 valve is the leak detection system. It gives a signal in the form of an audible sound to let you fix the problem in time. Apart from that, you can adjust the water volume you need in each flush. As you can see, the water-saving features are quite impressive. A strong jet makes an effective tank-cleaning mechanism. It’s more like a self-cleaning system that activates with each flush. The height is adjustable from 11 to 13.8 inches to fit most standard toilets. You get a simple tool-free installation, which is good news for the average DIYer. HC660 is quieter than previous models. It’s robust, user-friendly, and handy. A must-have in stopping leaks from day one. There are many affordable fill valves out there for the budget hunter. But Mansfield gives a cost-effective solution; one that doesn’t sacrifice quality and performance. Its appealing style and simplicity are sure to get your attention. For most users, it’s pretty easy to install and service. Best of all, you can easily convert to other repair kits if the need arises. Robust plastic construction provides long-term durability. It makes a reliable choice for everyday use. The refill rate is more impressive than most standard models. It comes with every part you need to replace your old fill valve. The instructions are clear and with enough detail. The noise level is minimal, almost like a humming sound. Remember, this isn’t a universal valve. 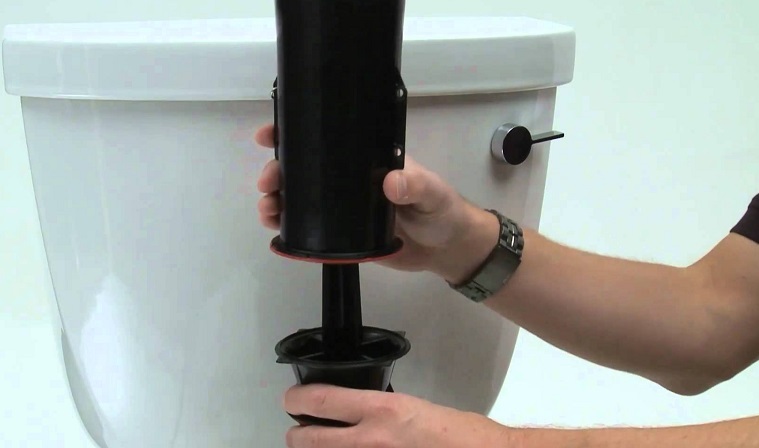 Mansfield toilet fill valve is a budget-friendly option that saves both time and money. It’s a versatile valve that can withstand the test of time. Whereas Mansfield offers a fill valve for a restricted budget, LDR gives you the best toilet repair kit. 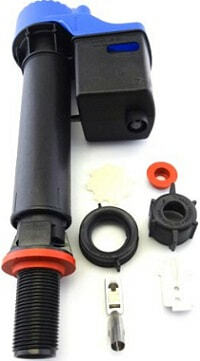 The kit includes a fill valve and a flapper. The valve makes a durable choice, and you expect minimal maintenance in between uses. It has a built-in float with the anti-siphon feature. That makes repairs a breeze and eliminates the risk of contaminating the fresh water. Fluid flow is adjustable to control water usage. You can extend the height from 8 to 12 inches to fit your specific toilet. The valve is one of the quietest out there. It might not match the refill capacity of models the likes of Fluidmaster. However, the rate is more than sufficient to suit the purpose. The flapper is sturdy and reliable to provide a superior seal. It uses commercial-grade materials, which are durable enough to extend the time between replacements. Both the valve and flapper are resistant to chemicals and other elements. They neither rust nor corrode for ultimate performance. You get the right amount of convenience you need during installation. The instructions are clear, so there’s nothing to fret about. The valve is for toilets with a flush capacity of at least 3 gallons. To some, the head of the valve is a bit smaller. However, it works just fine. LDR 503 offers everything you need to replace an old fill valve. The durability is excellent, and the overall performance is no lesser. You get all these without the hefty price tag. American Standard is among the finest brands for toilet fill valves. To be more specific, it makes the best accessories to go with your toilet fill valve. This particular package is one of a kind. 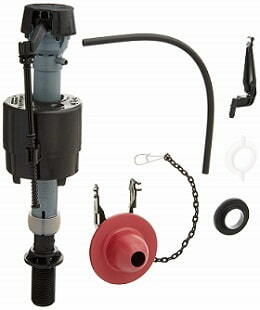 It includes the 400A Fluidmaster fill valve, washer, coupling nuts, and a lock. Also in the kit is a refill tube. 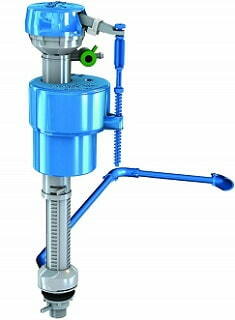 The valve offers anti-siphon convenience to avoid the risk of contamination. You get two times the refill rate than standard models. The height extends from 9 to 14 inches, which provides a perfect fit for your specific toilet design. Not to forget, the valve handles volumes of 3.5 to 7 gallons per flush. The accessories are one of the best pieces out there. You get quality assurance with high efficiency to match. This kit offers optimal performance with no minuses to talk about. A combination of Fluidmaster and American Standard makes it a top-notch. Plus, it’s versatile enough to fit all toilet requirements. Toilet owners have to deal with three major problems: leaky valves, noisy filling, and a weak flush. Each can lead to even more problems. Choose a material that withstands the test of time. Go for superior ABS and rubber materials, which provide higher resistance to corrosion. It’s crucial, especially for high-end, small investment toilets. The higher the refill rate, the less time you’ll have to wait. Consider additional water-saving features to reduce energy bills. For instance, a leak detection system or adjustable water volume. Choose a quiet water filling system. Most of the latest models operate quietly. After all, you don’t want everyone to know someone is using the toilet, do you? A flush valve can’t fit all toilets. For instance, most models aren’t compatible with old toilets. Ensure to check the dimensions and height. An adjustable height will be a huge advantage. An inferior seal makes a weak flushing pressure. Choose a flapper or valve with a tight seal. It will reduce water wastage. A toilet flush valve will have to malfunction at one point, and you don’t want to be caught unawares when the time comes. So, what are tips for replacing a toilet flush valve? Shut off the water inlet and thoroughly drain the tank. Use a sponge or vacuum to dry. Remove the tank if necessary. Remove the thick rubber gasket and loosen the nut underneath. By doing so, the flush valve will be able to come right off. Clean the area on the sides to remove debris. Your new valve goes in just the same way the old one came out. Keep the thread side up and direct through the hole. Don’t tighten too much; otherwise, the tank might crack. Adjust the height of the tube. In most cases, the manufacturer specifies the correct height. Make it at least one inch below the hole where the flush lever mounts. Attach the rubber gasket and use the nut to screw it into position. Make it tight for a perfect seal. Replace the hose and reconnect flapper chain. Flush a few times to make sure there’s no leak. Use a flashlight to check for drips under the toilet. If any, tighten the connections. As much as we want to say that our selection comprises the only best toilet flush valves out there, it’s not. However, what makes the above products the best is their repeated success and superior quality. The specific manufacturers spare zero expense at making them one of the most effective on the market. Keep them in mind when planning for the next replacement, and you’ll see a significant improvement. Right now, the question in your mind shouldn’t be “Should I get one?” but rather “Which should I Buy?’. Give one of them a try, and you won’t regret it!